Things weren’t going quite as planned for Carolyn Pye and her teammates. Their miniature aluminum-framed dragster, representing the skills they acquired in ME 210 Manufacturing and Design, had caught fire and sat idle in the hallway on the ground floor of Acopian Engineering Center. Despite the pressure of facing competing cars designed and built by students on 11 other teams, their spirits soared. A tiny speaker mounted on the frame with black electrical tape blared “Stayin’ Alive,” an anthem to their optimism and competitive spirit. The car, the work of Pye, James Waring, and Duane Cardino, also had some additional flair with its colorful support wings, a touch added by art major Jack Garber. “It may not win, but it looks great,” Pye said. A December ritual for at least the past quarter century, the race brought together sophomore mechanical engineering students who put the advanced math and engineering they learned during the fall semester to the test. 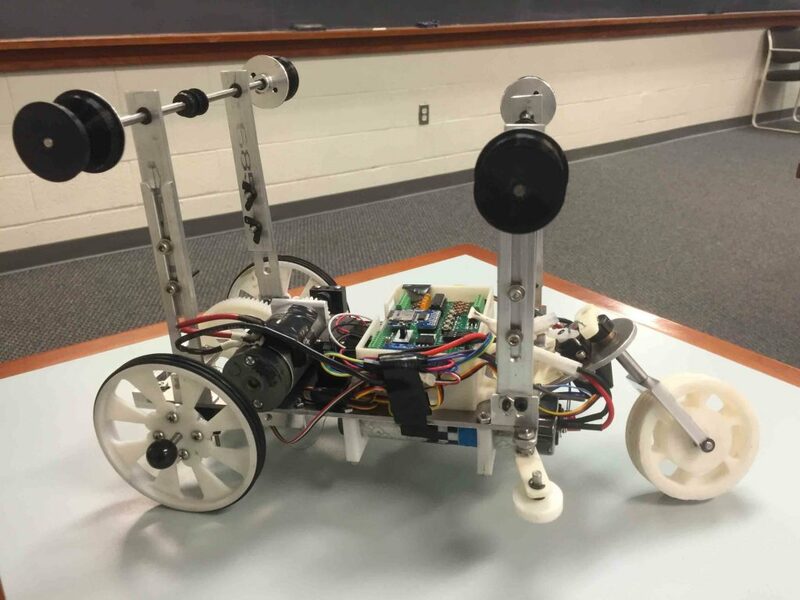 The goal is to design and build a battery-powered mini-dragster that can complete a round-trip run on a 45-foot track. This year the track was modified with a ramp, which added a challenging new twist to the exercise, along with a rough and unguided section of track. Students could choose to take that route or attach their car to an overhead cable resembling a ski lift. Most of the teams chose to use the overhead cable, which required more complex car designs but provided for more predictable results, said Steve Nesbit, professor of mechanical engineering. “Students can tap into the designs of those who went before them, but they can’t duplicate anything,” he said. Students are influenced and guided not only by their instructors but also by the shop technicians who teach them about the manufacturing of the dragsters, Nesbit added. This year’s winning team, Ka-Chow, is made up of Zev Granowitz, Casey Goodwin, Marat Erikov, and Mike Dunn. Nesbit described their dragster as “a technical marvel,” with its sophisticated braking system, reversing transmission, and drivetrain. It completed the run in 12.67 seconds, outpacing the second-place finisher by 20 seconds. The race provides a solid training ground for students as they progress toward designing and fabricating a car for the national Formula Hybrid competition each spring. “This is one of the things that we do in the engineering division and the College that you won’t find anywhere else,” Nesbit said.